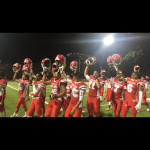 After dominating Van Nuys on Nov. 13, with a score of 49-15, the football team continues their way in the playoffs facing North Hollywood High on Nov. 20. The boys started off shaky giving off the impression of a weak defense when Van Nuys took the lead in the first three minutes of the game, 7-0. Quarterback, David Rothenberg, was quick to bring his team back in less than a minute after the Wolves’ first touchdown tying up the score, 7-7, and then again later in the quarter giving his team a lead of 14-7. Going into the second quarter David scored another touchdown bringing up his team to 21-7 slipping through the Van Nuys defensive line. Surmier Cunningham was quick to follow scoring a touchdown during the second quarter bringing up his team another six points and with another field goal ending the first half 28-7. Not long into the second half Tyree Moore scored two touchdowns in three minutes, keeping his team in a lead of 42-7. Max Perandize had a 40-yard run before scoring his first touchdown of the game, a touchdown he had been searching for since the Belmont game. The Wolves struggled to keep up, but were able to score another touchdown later in the fourth quarter and with a two point conversion ended the game with a final score of 49-15. The boys continue to seek glory at the Cerritos College Arena for the final championship game on Dec. 5 as they move upward and forward through the playoffs.